My mom's cousin collects and sells vintage clothes, and he has this swing coat on a dress form in the living room. It's leopard. Like, it's actually leopard. If it wasn't at least 50 years old I'd be totally offended. At this point it's a relic, a masterpiece and better on display than shoved in a dark corner somewhere, no? Oh my goodness girlfriend, you know I'm dying! You need to sneak this back to NY with you! 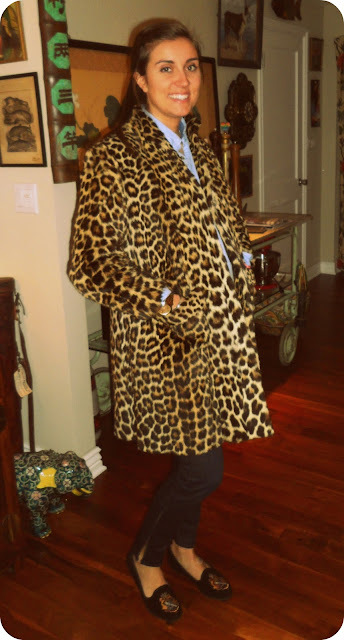 such a fun coat, thanks for sharing! The fact that it would be dead right now anyway, does make a difference <3 It's absolutely royal. For how long are you home in Seattle? Tomorrow is forecasted to be rainy and cold. I shouldn't be surprised. It´s beautiful! And I love your loafers. great coat! Love your blog!